Five years after “Hardware”, the album that presented Agent Side Grinder to a wider audience, there is the next, real, album. Where older material was more raw and primitive than the music on “Hardware”, the latter is both more accessible and better produced that what came before. Now our Swedes found a label that was new to me and their sound is again more polished, more synthpop in many songs. The songs that have been made available before the launch of “Alkimia” already hinted to that ‘new direction’. 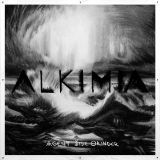 “Alkimia” opens quite catchy and recognisable with a ‘minimal wave sound’ (drumcomputer and bass guitar), but “Into The Wild” is not as wild as we got to know ASG. Other songs are similarly somewhat too synthpoppy for me. The tempo is lower, the sound softer and the same can be said about the vocals. Nope, to me “Alkimia” does not come near “Hardware”. It is not a bad album though, just a step away from my musical taste. The band will again play on the Wave Gotik Treffen where I also saw them a couple of years ago. I wonder if they are scheduled in a bigger venue than the Moritzbastei this time and if the music will start to ‘live more’ after having heard them live.